Self primming jet pump equipped with Venturi system providing powerful suction capacity above 8 m. Pump body in stainless steel. Pump ready for the connection of a pressure gauge and a pressure switch directly on the pump body to run as a booster set. 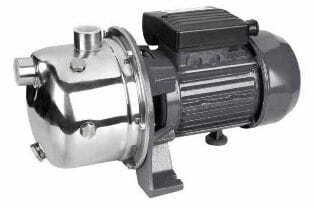 Pump body in staninless steel. Ideal pump for operation as a hydropneumatic booster set, filling tanks and for all installations where there is a suction height of around 8 m between the water level and the pump. Centrifugal single stage pump manufactured completly in gray cast iron for a hard and continuous operation. Pump body designed with volute. Self primming jet pump equipped with Venturi system providing powerful suction capacity above 8 m. Made in grey cast iron.